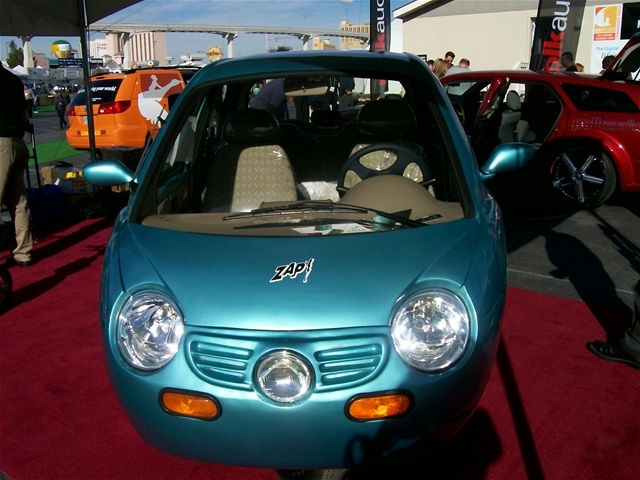 I first saw real, live electric cars at the San Francisco Solar Homes tour about a year ago, then again in January at the ZAP display at the Consumer Electronics Show in Las Vegas (pictures here), and then ran into another ZAP booth at the Maker Faire a few months ago. But my hands were too full then to write about them. Lazy. Thanks to "Who Killed the Electric Car?" as well as pricey oil and the end of the world as we know it supposedly being nigh, Zero Air Pollution (ZAP) vehicles are in high demand. 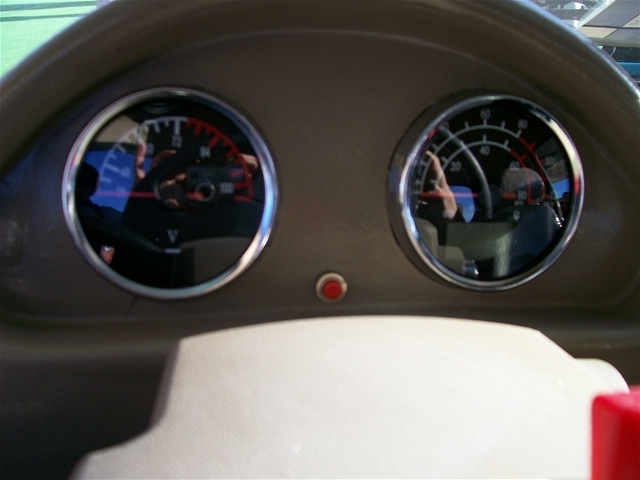 They're cute and zippy, but you can only drive the Xebra about 40mph for 40 miles before needing to plug it in again. 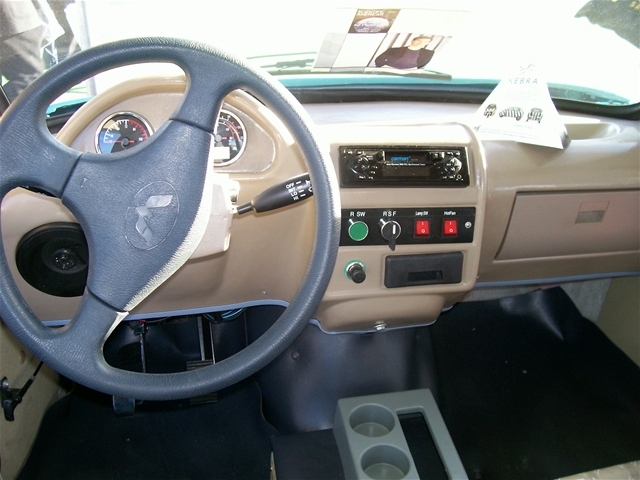 And as you can glean from the photos, the interior is less than luxurious--more along the lines of a Yugo. 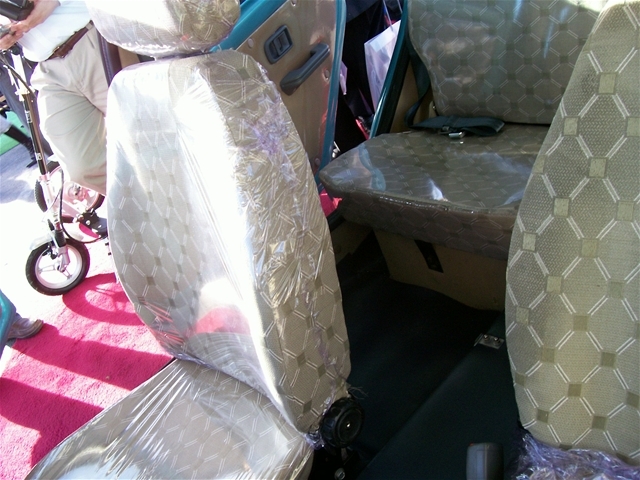 Take heart, however; the plastic seat coverings are removable and were probably for display only. I'm 5' 5.5" and fit comfortably in the front, though you might feel cramped if you're taller. But who needs leg room and speed when you're just running errands around town? In San Francisco, at least, a dawdling Xebra might be perfect. I've come to believe that so many drivers here are simply too stoned to enter the freeway on-ramp without first pausing to take in the view and breathe in that ominpresent scent of non-native eucalyptus. This is frustrating to a native of Chicago, where we drive (yes, defensively) as if steering a tommy gun. And have patience; charging the Xebra takes about six hours. Once you're rolling, though, it only winds up costing a couple of pennies per mile worth of electricity. 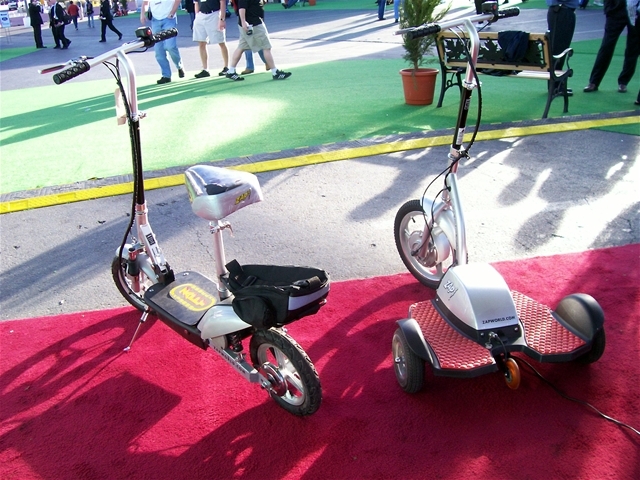 The Santa Rosa-based ZAP company sells a whole line of two, three and four-wheeled electric cars, scooters, bikes, and ATVs, many of which Brazilian drivers have enjoyed for some time. An ethanol car is planned for next year. 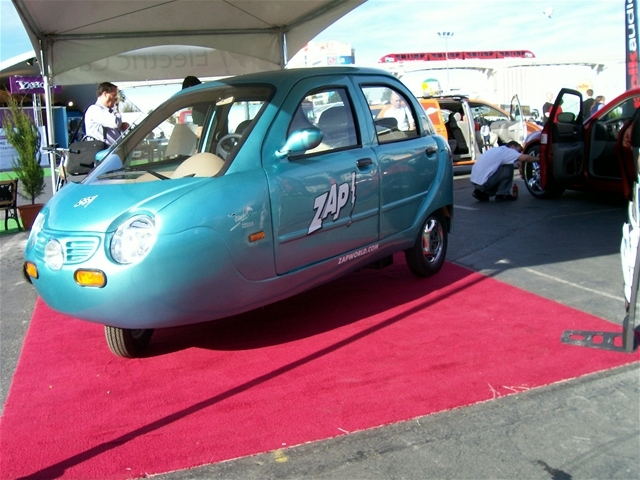 ZAP owns the U.S. rights to distribute Smart cars, which you may have snapped a photo of on some European vacation. You can buy a ZAP Xebra for around $10,000 from a handful of U.S. dealerships in Santa Rosa, CA; Elizabeth, CO; Salem, OR; Mesa, AZ; Reno, NV; Exeter, NH; Vandergrift, PA; Kirkland and Fife, WA; and West Palm Beach, FL. But expect a wait list. The company is enjoying record sales, which is just about 300 cars, yet for now it's operating at a loss. As for higher-end electric autos, the first batch of electric Tesla sports cars, which cost close to six figures each, have already sold out. See a slideshow of ZAP cars here, and check out vintage tiny cars at the Microcar Museum. If you're partial to your old VW van and live in Northern California, you can contact Larry to help you convert the beast to a plug-in electric engine for around $4,000. Never mind, I misplaced his e-mail. Let me know if you find it. p.s. duh, I originally named the wrong model car in the first sentence of this post. never mind. p.p.s. Actually (following up from the p.s. ), no I didn't. I second guessed myself, but I think it really was an electric RAV-4 that I mentioned in the first place. These electric cars have lovely colors, and they look cute too. You are a lucky person to be able to check some of them. There are also electric cars that are created in other countries like Japan, Germany and Korea. 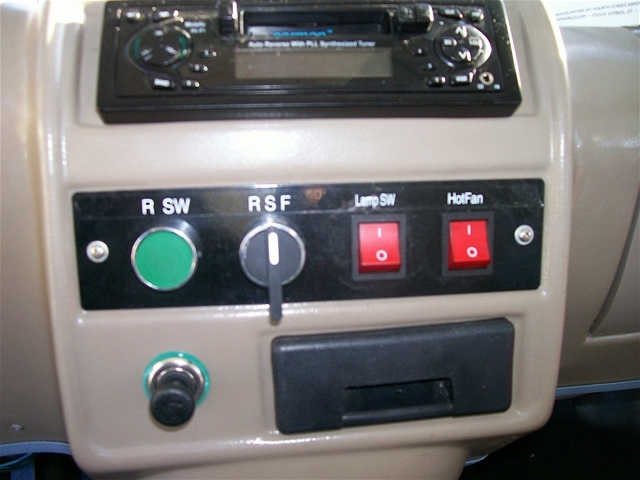 The technology is becoming a project for some car companies in a bid to pursue sustainable development. Basically have the cash someday I would buy sucvh car for my daughter.She'd fell in love with it without a doubt. if we follow your logic...then there are no green choices... not even a solar car whose body manufacturing also requires the use of petrochemicals to produce(but this would be the greenest of choices if it was commercially available and convenient). Lovely cars. Check out some lovely gold rings. The electric cars is the new generation of Automobiles this will safe money and take care of the environment , get you're electric car now the yugo is a good option. these cars are taking over the world. i would love to hear more about this technology. all these cars are so awesome. wish i could afford one. BG Automotive Group has a car that will travel 80-100 miles per charge for $15,995. Finally a car that most Americans can afford. Did you know that 80% of all drivers, drive less than 50 miles per day? 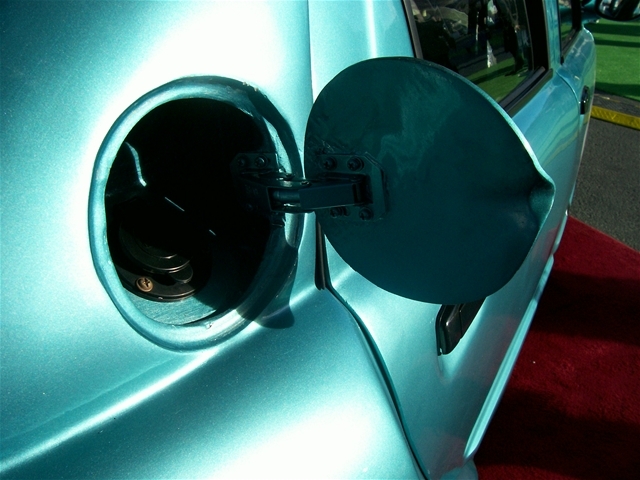 This new car will cost an equivalent of $0.20-0.25 cents/gallon (depending on electricity rates in your area). Electric, green cars, that was pretty one. If i have money soon maybe i will buy one of that car. Because now a day, the gasoline was too expensive. If I have the money someday I would buy sucvh car for my daughter.She would fell in love with it for sure. I wouldn't exactly call these cars green. They are just moving the pollution off the road to the power plants instead.